PONE Architecture has been named a winner in the first annual AAP American Architecture Prize, which recognizes the most outstanding architecture worldwide. The AAP American Architecture Prize honours exceptional designs in 41 categories across three disciplines: architectural design, interior design, and landscape architecture. 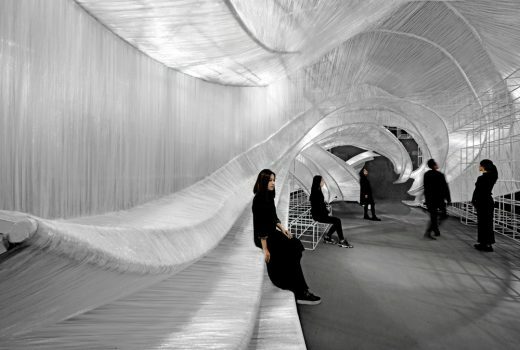 PONE ARCHITECTURE won Gold in the Interior Design/Exhibition category for Transparent Shell. 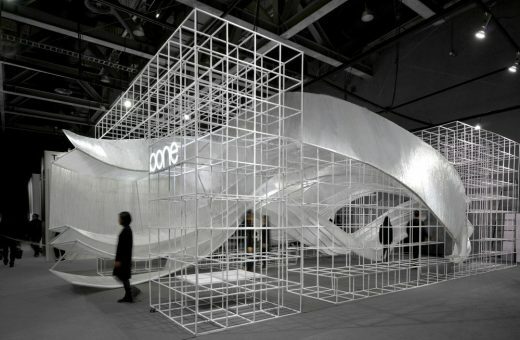 Transparent Shell, The PONE ARCHITECTURE Experience Pavilion (Guangzhou Design Week) attempted to rediscover the alternating potential of organized construction. 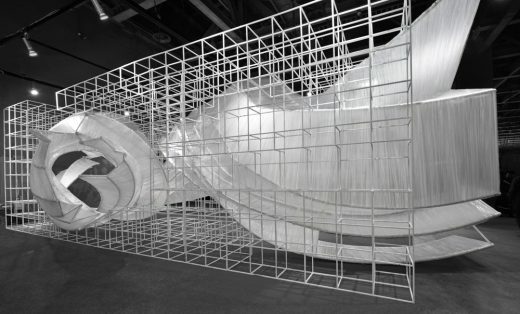 Urged by the question on how to integrate architecture to further interact and blend cities, environments, human beings and space, it created the construction unit “Transparent Shell”. Meanwhile, it is also a reflection on creating and recreating. The whole structure consists of 30 main bone models and 3 groups of large curves. 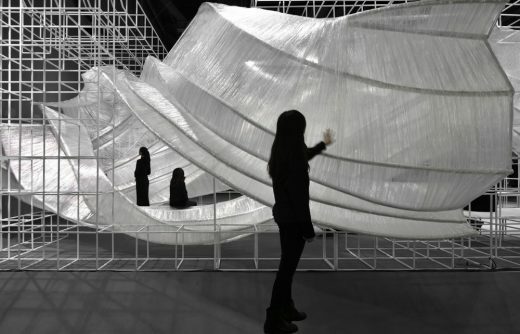 Through multiple layers of woven and crisscross transparent films, an interface of dynamic tension is unfolded with the whole space filled with flowing dynamics. Between concurring and conflicts, it produces various functional spaces, such as entrance, wall, ceiling, window, desktop or seating area. 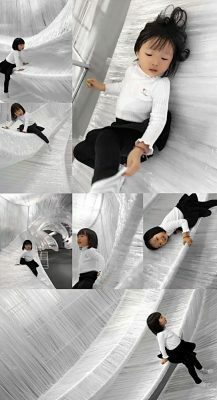 Visitors may feel free to use them and imagine the meaning of different “shell” functions, thus constructing a space with “flexible and functional ideas”. 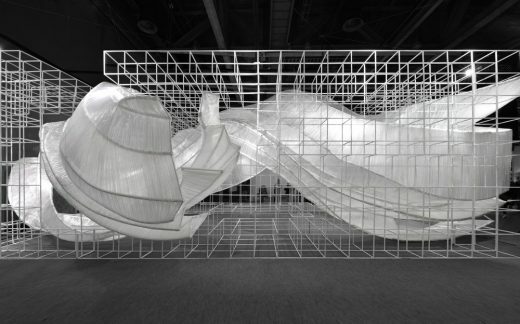 Being translucent and unstable, the spaces gleam with light and shadow and keep changing between manifestations and fading. The multi-layers of open combinations are the new representation and interpretation of internal and external open sites that interact both inside and outside. 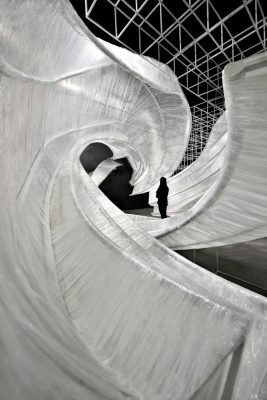 Derived from concepts, Transparent Shell gains inspiration from a rich variety of sequences in nature. By dissecting, extracting shell structures and restructuring, it reveals the tension of life evolution. Transparent films are chosen to connect the interface of the shell. They are woven like silks, steady but also taking on an organic and casual form. Penetrated by the light, the texture produces a flexible and changing effect of light and shadow, thus constructing a translucent, dim, intensity-varying, stable yet uncertain world. The main body of the structure is comprised of metal frames and a large number of irregular curved steels. Each of the 30 arched frames varies in its undulating rhythm, irregular and poly-directional. It is a big challenge as to how to accurately capture the localization and to fully restore the overall form. We went through a lot of experiments and eventually came up with the simplest and most effective method. The curves in the helix were selected for accurate radian in each segment so as to get the accurate nodes. 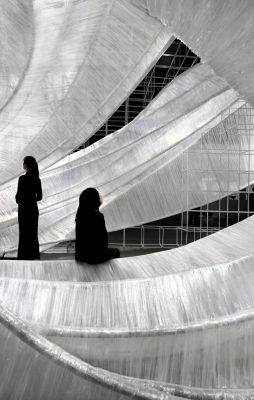 The 3-D coordination of each node was positioned in the space, based on which another curve was made by stretching steel pipes. Then, they were joined in groups for interconnection. 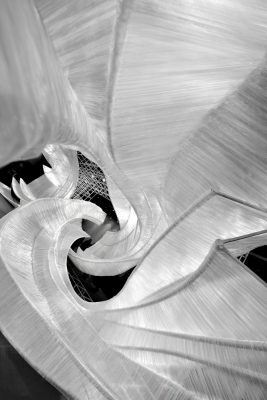 Finally, a 3-D dynamic and freely-crisscrossing helix skeleton prototype came into being. 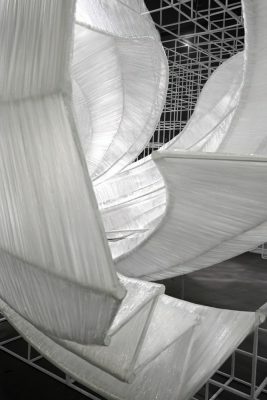 After the skeleton was assembled, the transparent films were used to link the interface: step 1. base laying, step 2. silk stroking, and step 3. weaving. 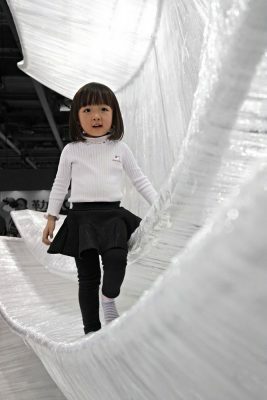 The whole weaving process is like silkworms spinning around cocoons. 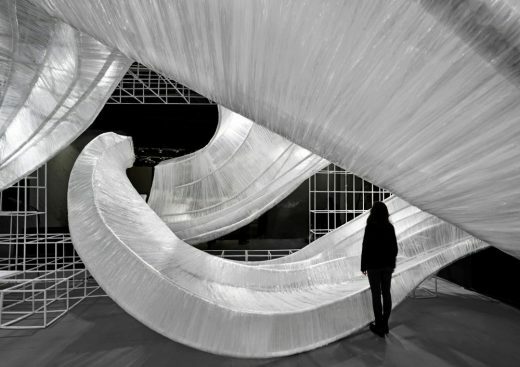 Rather than calling it a construction process, it is as a show of “behavioral art”. PONE Architecture is a dream-making cross-border design team. With cutting-edge ideas, rigorous production, systematic management, and efficient implementation as criteria, it helps customers to create a unique image and explore the core values of art through international architectural design, space design, landscape design, art installations, as well as soft design. It gathers a team of outstanding designers who place 100% focus on the design, with perseverance and pragmatism, and the courage to break through the boundary as the utmost priority. The team’s commitment and creativity enhance its design philosophy and stimulates the desire to inspire. 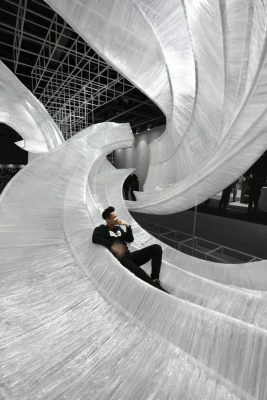 It conducts detailed research on the unique background of each project, focusing on the positive interaction of building space with materials, lightings, shapes, and details. Its design for projects bases the environment and characteristics of the context to display the rich dynamics within. It places the final product of the highest value and as the ultimate goal, removing all boundaries and barriers and striving to ensure excellent quality of exceptional projects produced.